Joseph Ratzinger, the man of Faith turns 85 Are the attacks on the Vatican anti money-laundering law attacks against Holy See sovereignty? 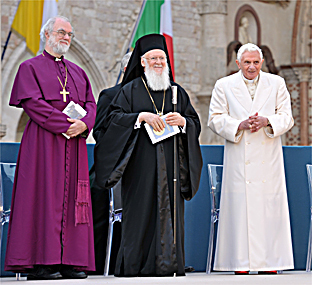 Benedict XVI’s effort for Unity. What will be of it? Even the new evangelization which the Pope has wanted in a particular way must have an ecumenical dimension. Benedict XVI made an explicit reference to this ecumenical dimension in announcing the establishment of the New Pontifical Council for Promoting the New Evangelization at the celebration of First Vespers of the Solemnity of Sts Peter and Paul in 2010: «The challenge of the new evangelization calls into question the universal Church and asks us to continue with commitment our search for full Christian unity». With his ecumenical commitment, Pope Benedict XVI witnesses in an exemplary way to what the ecumenical responsibility of every bishop in the Catholic Church consists of, described by the Code of Canon law: the diocesan bishop «is to act with kindness and charity toward those who are not in full communion with the Catholic Church, fostering ecumenism as it is understood by the Church» (Can. 383 § 3). So, the promotion of the cause of ecumenism is implicit in the bishop’s pastoral ministry itself, which is essentially a service to unity. Some progressive Catholic currents condemned the initiative as a gravely anti-ecumenical act: that is, as a restoration of the ideology of the «great return» and as the intention of the Catholic Church to «expand its empire» by ripping away portions of rival Churches. But in the Anglican camp, the initiative did not provoke any rejection. This was followed by the entry into the Church of Rome of thousands of faithful and dozens of priests and bishops, accommodated in special «ordinariates», two of them so far, the first in Great Britain and the second in the United States. When the Anglicanorum Coetibus was announced, cardinal Walter Kasper, then president of the Pontifical Council for Christian Unity, was in Cyprus, because the island was hosting, from October 16-23, the second round (after the first in Ravenna in 2007) of theological dialogue between Catholics and Orthodox on how to understand Papal primacy. An ecumenical dialogue of great importance, in which Kasper led the delegation from Rome. «In Cyprus – Kasper explained – in order to avoid misunderstandings, I immediately told our Orthodox counterparts that this is not a matter of proselytism or a new Uniatism. [...] Uniatism is an historical phenomenon involving the Eastern Churches, while the Anglicans are from the Latin tradition. The Balamand document of 1993 is still valid, according to which this is a phenomenon of the past that took place in unrepeatable circumstances. It is not a method for the present or the future. The Orthodox were mainly interested in understanding the nature of the personal ordinariates for the Anglicans, and I clarified that this is not a matter of a Church ‘sui iuris’, and therefore there will not be the head of a Church, but an ordinary with delegated powers». It means that while a «Uniate» Church has its own structured hierarchy, with a patriarch and territorial dioceses, none of this will apply to the former Anglican «personal ordinariates», which will provide pastoral care for the faithful but without their own ecclesiastical territory, a little bit like the military ordinariates. The dialogue with Orthodox is living a splendid period. Here and then, the hypothesis of a meeting between the Pope and the Patriarch of Russian Orthodox Church comes out from the Vatican corridors. This meeting could have happened during the Papal trip to Croatia the last year, or could even happen in Bari, the Italian town dedicated to Saint Nicholas. Coming from Myra, Turkey, the bishop Nicholas has been considered an ideal «bridge» between Eastern and Western Christians (Orthodox and Christians) since his body had been translated to Bari. 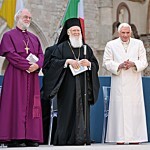 The friendship between Benedict XVI and the Patriarch of Moscow and all of Russia obviously aids the dialogue. Kyrill recently expressed «brotherly respect and affection» to the Pope. Everything seems to be easy on that side. What kind of ecumenism is the Papal one? During his trip to Cologne in 2005, in his August 19 address to the representatives of the Protestant and Orthodox Churches, the Pope spoke several times off the cuff, and said that he did not believe in an ecumenism focused exclusively on institutions. For him, the serious question is how the Church should bear witness to the Word of God in the world: this is a problem Christianity has faced since the second century, and since then the question has been resolved through decisions which, according to Ratzinger, should still hold true for the Church of today. The criticism aimed at the Pope of ditching ecumenism, of putting the embrace with the Lefebvrists in front of dialogue with the other Christian confessions can no more hold up. Even because the facts say the opposite. Those most unyielding in rejecting the pope’s offers of peace are precisely the followers of the schismatic archbishop Marcel Lefebvre. And they reject them precisely on account of the significant steps forward – for them, a concession to error – taken by Benedict XVI on the path of reconciliation with the Anglicans, with the Churches of the East, and even with the heirs of Martin Luther. For the pope’s 85th birthday on Monday, his own brother showed up in Rome empty handed. But the brothers of the controversial Catholic splinter group Society of St. Pius X (SSPX) were more generous. They sent a letter – and its contents may be the greatest gift yet to the papacy of Benedict XVI. The Pope has long wanted to heal the schism with the SSPX and bring the conservative followers of the late French Archbishop Marcel Lefebvre back into the fold. The Catholic traditionalist Lefebvre founded the SSPX in 1969 in answer to the reforms pushed through by the Second Vatican Council. The group has grown to include tens of thousands of followers and hundreds of priests — a «painful wound in the body of the church» Benedict XVI said. Bernard Fellay, General Superior of the SSPX gave his answer to the Congregation for the Doctrine of the Faith, after a meeting that he held with the top officials of the Congregation on Monday, 16th of April 2012. After their last meeting, one month ago, Holy See gave to the SSPX a one month deadline to give an answer to the Doctrinal Preamble they sketched out about six months ago. A sort of take-it-leave-it conditions for welcoming again SSPX within the Catholic Church. The text of the Preamble remained secret. But what requested – insiders of the Congregation of the Doctrine of the Faith assured – was just the minimum to be in communion with Catholic Church. That is to adhere to the Catholic Doctrine, to acknowledge the authority of the Pope and – finally – to acknowledge the validity of the Second Vatican Council. Even the text of the Fellay’s answer remained secret. But Fr. Federico Lombardi, director of the Holy See Press Office, described the text of the letter as «substantially different from the other answers the Fraternity previously gave» to the Congregation, albeit there are still «requests for further clarifications». But – Fr. Lombardi added – «this is encouraging». Maybe the Fellay’s «friendly letter» has already been analyzed during the feria quarta meeting of the Congregation of the Doctrine of the Faith. The feria quarta is a meeting to be held monthly on a Wednesday. During that meeting, the officials of the Congregation focuses on the current cases, and take decisions whether to condemn, admonish or not to take action toward books, doctrines, cases that they are called to study. The conclusions of the Congregation for the Doctrine of the Faith will be delivered to Ecclesia Dei, the commission that is taking care of the dialogues of the Catholic Church with Lefevbrists and that – after the scandal followed to the revoke of the excommunication to four traditionalist bishops, one of those, Richard Williamson, publicly denied Holocaust and made anti-Semitic declarations – the Pope put under the guidance of William Levada, prefect of the Congregation of the Doctrine of the Faith. Levada substituted card. Darìo Castrillòn Hoyos, who was very close to the Lefevbrist world and made several pressures to conclude the agreement before he would end his charge in Ecclesia Dei. The Pope will make the final decision. And, after the Papal decision, a text issued by both Ecclesia Dei and SSPX will be published. This will be the only official text, and no mention – nor publishing – will be given to the original preamble. The preamble had been proposed the last September by the Congregation of the Doctrine of the Faith as the primary condition to let the SSPX rejoin to the Catholic Church. After the preamble, the meetings had come one after another. The last meeting took place on March, 16th. On one side of the table, William Levada. On the other side, Bernard Fellay. It was a two hours meeting to discuss what Fellay answered to the Commission Ecclesia Dei following the Doctrinal Preamble. Ecclesia Dei – as the official communiqué underlined – did not deem satisfactory the Fellay’s answer, that «could not be sufficient to overtake the doctrinal problems which are on the basis of the breaching between Holy See and SSPX». In fact, what leaked out from the SSPX was that there had been a very intense debate. A debate in some way foxily leaded by Bernard Fellay. Bernard Fellay is a skillful story teller. In his speeches – delivered through a very efficient network – Fellay explains that Rome is the place where confusion and unfairness rule. More: the Roman Curia would not obey the Pope. Fellay acts as a divisive force, and he tries to allies with the ones that claim themselves «conservatives» within the Church. The reasons why SSPX and the «right-wing» of the Church should ally are not theological, but just formal. Sometimes, the revoke of the excommunication to four bishops ordained by Lefevbre in 1988 –Fellay was one of those bishops – is completely misrepresented. Once, the Pope opened his arms in order to give the chance to redeem to those who are wrong. Another time, Fellay insinuates that this opening is the first step to revise the Second Vatican Council. Or maybe it is not. Analyzing the Fellay’speeches means to find out that each issue oscillates from an extreme to another. The conclusion – ça va sans dire – is always the same: SSPX has the true faith, while inside the Vatican they had long time ago decided to be out of the rails. So, when the first Fellay’s answer arrived in Rome, insiders widely previewed that this would have been an unsatisfactory response. After one month, Fellay arrived in the Congregation of the Doctrine of the Faith with another answer. Press anticipated that the second answer «not substantially» amended the preamble, thus letting think about an opportunity to treat the contents of it. This seemed to diminish in some way the effort of Benedict XVI, that – notwithstanding the polemics within the Church of Rome because of Williamson’s denial of the Holocaust, because of the Good Friday prayers for the conversion of the Jewish contained in the liberalized ancient rite – made everything he could to avoid the endurance of the schism. At the same time, the Pope reaffirmed with determination that the Second Vatican Council is not part of the discussion, as it is not part of discussion the obedience to the Pope and to the Church. The German Cardinal Josef Becker, an advisor to the Congregation for the Doctrine of the Faith and a participant in the talks with the SSPX, said recently that it is difficult to find common ground in the positions held by the Catholic Church and the Society of St. Pius X. But, he added, each side must «try to understand» the other. He also said that the Church must re-examine all Vatican II texts to understand them from today’s perspective. Fellay, for his part, in light of the letter he recently sent to the Pope, asked his followers to «double their fervor and magnanimity in prayer and sacrifice in these holy days and during the weeks following Easter, so that God’s will be done». It is no secret that there are oppositions within the Society and in the episcopates of countries where the traditional wing of the Society is more present, but also in a small group within the Vatican. In the more radical Lefebvrian groups, which in truth hold positions close to sedevacantism, the agreement is seen as surrendering to Rome’s offers instead of keeping up the fight to «convert» the Holy See and go back in time, to the Church of fifty years ago. The other side believes that Benedict XVI has been too generous in the spirit of reconciliation and should not have tolerated that any Catholic believer felt able to criticize the Second Vatican Council. This difficult climate and the tensions that will inevitably rise in the next few weeks are exemplified by the leak of a confidential letter that the secretary of the Ecclesia Dei Commission, Mgr. Guido Pozzo, recently sent to the abbot Philippe Laguerie, superior of the Institute of the Good Shepherd, society of apostolic life based on the pontifical right, which celebrates mass according to the Latin rite. Pozzo’s letter included some observations and suggestions for the Institute following a canonical visit some time ago. Its release, according to abbot Laguerie, means that someone wants to put a spanner in the works and disrupt the dialogue between the Holy See and the Lefebvrists. In the letter, Pozzo addressed mainly two points. The first concerns the «exclusive» use awarded to the Institute of Pius V missal. Ecclesia Dei suggested that in the charters of the Institute of the Good Shepherd it would be better to avoid the word «exclusive» and simply highlight that it is the Institute’s «own rite». «The matter of practicing the extraordinary form, as formulated in the charters – Pozzo writes – must be defined in the spirit of Summorum Pontificum. It would be better to simply describe this form as the Institute’s ‘own rite’, without mentioning ‘exclusivity’». The second concerns the criticism of the Second Vatican Council. «Rather than criticize – Pozzo writes – however rightly and constructively, the Vatican II, educators should channel their efforts in conveying the whole of the Church teachings, focusing on the hermeneutics of renovation within continuity and starting, as a base, from the integrity of the Catholic doctrine as exposed in the catechism of the Catholic Church». The secretary of Ecclesia Dei so basically asked the conservative group already in communion with Rome to make an effort in closely following the indications of Benedict XVI concerning the interpretation of conciliar documents. But this confidential letter might have been leaked because it includes points that might discourage the Lefebvrians who are about to follow their superior Bernard Fellay on the way to full communion with Rome. Abbot Philippe Laguerie pointed it out in a statement released on several websites that «there are people in Rome who are very opposed to any form of agreement». How would the «encouraging» Fellay’s answer be evaluated in the Vatican? Benedict XVI made of his pontificate a pontificate for unity, trying to repair the divides within the Catholic Church Still when he was Prefect for the Congregation of the Doctrine of the Faith, Joseph Ratzinger committed for unity and – in particular – strongly tried to avoid the Lefevbrist schism. The breach anyway occurred. Lefevbre was not authorized for an episcopal ordination – he wanted to ordain a new bishop that was intended to be his successor in SSPX (and this one was Fellay) – and so he backtracked and decided to ordain four bishops without the permission of Rome. The ordination had been fixed for June, 29th 1988. To prevent the illicit ordination, in June, 24 1988 John Paul II gave his permission for the ordination. It was not sufficient. The 15th of August, Lefevbre wrote in a letter that he did not need just one, but three bishops. The breach was unavoidable. From then on, an important debate took place, until the revoke of the excommunication to bishops ordained without the Papal permission. It was since June 2008 that Lefevbrist asked for the revoke of the excommunication. Lefevbrist said in exchange that they would respond to the proposals of Benedict XVI to bring the SSPX into a new communion with Rome. In 2007, Pope also gave the opportunity to celebrate the Holy Mass according to the rite of 1962. What will be the future of Benedict XVI’s effort for unity?